...before Christmas, before Seawood Designs, before my life was entirely taken over by small fluffy cakes, there was a time when I made amigurumi for fun (and actually I do currently have an Evil Necromancer on the hook at the moment but I'm slightly stumped by his hair so you'll have to wait for that). ...but wait, I hear you say. That IS a cake. 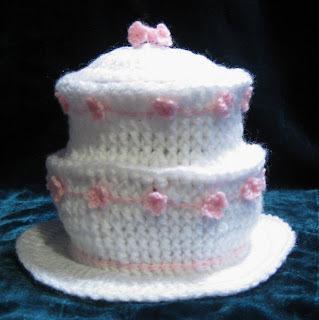 A two-tier American-style cake, no less, with little pink flowers on. 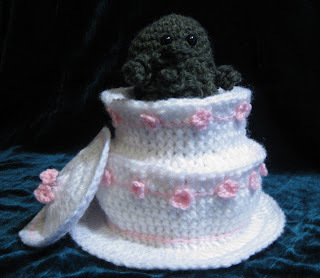 The cake is entirely my pattern and is made in one piece apart from the top; the Cthulhu is not-quite-canon from Creepy Cute (he has a much fatter bottom) and I owe thanks to Amber over at Cthulhu Crochet & Cousins for the tentacles examples. It deserves some better photos but that's all I could manage before madam claimed him for her own.